Your brakes are one of the most important parts of your vehicle, and one of the biggest factors for safety. At Chelsie’s Automotive, we take extra care in making sure your brakes are properly serviced and in great working order to ensure that you and your family stay safe on the road! We’ve been providing quality, reliable brake repair to Austin, TX for more than 20 years. 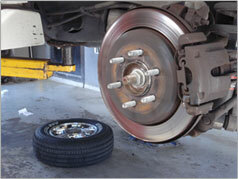 Our ASE Certified Mechanics are experts in maintaining your brakes health. Austin residents know they can trust us to take care of any issues their vehicle may be having, no matter what make or model of car they drive. In addition, we guarantee our brake services with a 12 month/12,000 mile warranty, so our customers know they are getting the best brake repair Austin has to offer! How do you know if you need to get your vehicle’s brakes checked? Your car, truck, SUV or minivan will give you several warning signs when it’s brakes need to be checked. Some cars have a light on the dash that indicates when a service is needed. Another definite sign you’re in need of immediate repair is if your brakes are not responding well, or you can push the pedal all the way to the floor. Some signs however, can be subtler. We’ve put together a list of some of the most common brake problems and causes, so you know when it’s time to take your vehicle to your trusted automotive repair shop. 1. You might hear a high-pitched squeal when you apply pressure to the brake. By design, when your brakes become extensively worn and your brake pads begin to rub against your rotor, it emits a shrill, squeaking noise, so you know that it’s time to have them serviced. 2. If your vehicle is pulling to one side while you’re braking, it could mean that they are wearing unevenly or you have a collapsed brake hose. 3. A “spongy” brake pedal could mean air has gotten into your brake lines, or you might be low on brake fluid. 4. If you hear a grinding or scraping noise, something could be lodged inside your vehicle’s brakes, or it could be the disc and the caliper rubbing together, indicating that you have worn them down completely, and are in immediate need of new ones. 5. If your brake pedal is vibrating, it could mean your vehicle is out of alignment, or that your rotors are warped. Ignoring brake repair and maintenance services can put you, your passengers, and other drivers on the road in serious danger. You should have your brakes checked every 6-12 months depending on use, or find out your brake’s condition during your annual state vehicle inspection. At Chelsie’s Automotive, we’ll make sure that your brakes stay in top shop! Visit us today, and let our team of experts show you why drivers chose us first for all of their brake repair needs in Austin, TX.